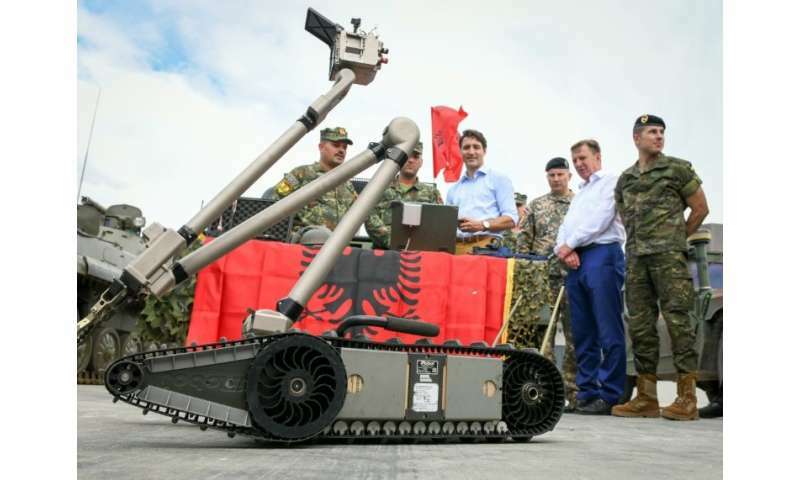 A military robot deployed with NATO troops in Latvia is inspected by Canadian Prime Minister Justin Trudeau in July 2018. The Pentagon's research wing said Friday it was investing $2 billion to develop a new generation of artificial intelligence with "human-like communication" skills. The Defense Advanced Research Projects Agency, or DARPA, will use the money to fund around 20 existing projects over the next five years and launch new ones over the next 12 months seeking a higher level of machine learning, the agency's director Steven Walker told reporters near Washington. "We are making multiple research investments aimed at transforming computers from specialized tools to partners in problem-solving," said Walker, referring to the new generation of machines as "AI Next." "We want to explore how machines can acquire human-like communication and reasoning capabilities, with the ability to recognize new situations and environments and adapt to them," he said in a statement. The current generation of smart machines and robots cannot be easily updated when new technology appears, and researchers want them to learn to update themselves, he said. Most of DARPA's research, which is entirely funded by the Pentagon, is focused on technologies that can be used in combat, such as drones that are becoming ever more autonomous. Another use could be DARPA's Blackjack project, which aims to develop a constellation of low-orbit satellites that will communicate with one another and can continuously cover military operations. "We will be looking at, under that program, to help satellites be able to communicate and develop a corporate behavior," Walker said. Hm, that looks like the flag of Albania.